Another week has passed, and more overwhelming news about investigations and subpoenas, back channels to Russians, and odd behavior towards our allies by Trump. Well, as we’ve been doing and will continue to do, we need to keep fighting back and to keep the pressure up on our legislators. Never doubt that what you are doing matters. Never doubt that Congress is noticing. So long as we don't give up, we can preserve to that which we hold most dear. 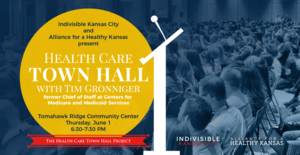 On June 1, IndivisibleKC and the Alliance for a Healthy Kansas to welcome Tim Gronniger of the Brookings Institution to Overland Park as part of the Health Care Town Hall Project. 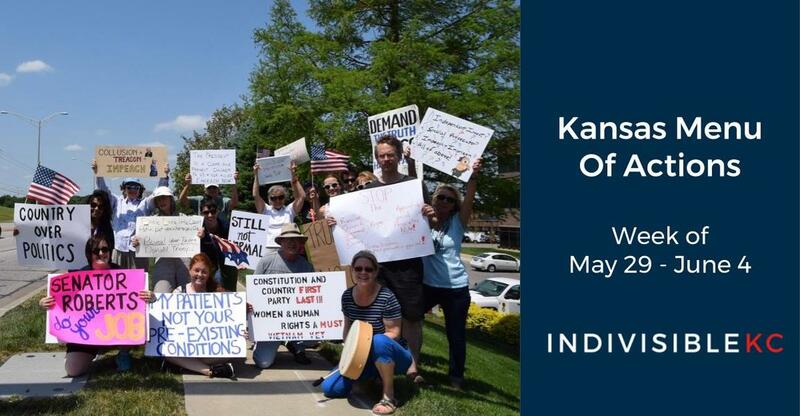 Tim will answer questions about the current law, and the bill that passed the House on May 4. For details, click HERE. 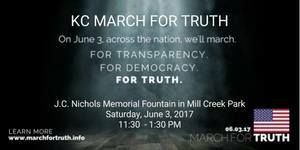 And, on June 3, join us, along with JoCo MoveOn and Lawyers for Good Government at the March For Truth KC. We're determined to keep the heat on our lawmakers when it comes to investigating connections between Trump and Russia, and restoring faith and trust in the American government. For details click HERE. Congress is in recess for the week of May 29 - June 4, and we heard that if senators get blowback on TrumpCare, they will tell Mitch McConnell, the Senate Majority Leader, it’s over. 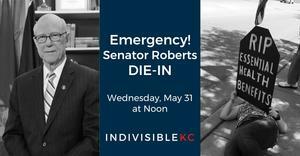 We will visit Roberts’ office for a DIE-IN. We need to make sure Roberts who sits on the Senate Health, Education, Labor and Pensions Committee knows we don’t need a new bill. The ACA works. For details, click HERE. 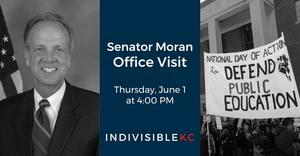 We will visit Moran’s office to ask him to oppose Trump Administration and Education Secretary’s plans to gut one of the cornerstones of our country, our public education system. He keeps telling us he's a big supporter of public schools, and we're going to make sure to hold him to his statement. For details, click HERE. Enjoy your holiday weekend and come Tuesday, we'll see you out there.